As with the funding of any business, those providing any type of funding to LCCs will consider the business model/management, the quality of the corporate credit and any underlying assets to be financed. In each of theses areas, financiers look at a wide range of factors. In many ways, LCCs are no different from full service airlines in this respect. The LCC business model is now well established throughout the world and low cost operators are among some of the biggest airlines globally. Nevertheless, it is still regarded to some extent as a newer model, and financiers will typically take a more rigorous approach when considering the provision of funds to start-up and younger airlines. Even where the model is not really very new, low cost operators often pursue higher growth rates, and this can also be a source of additional risk. Perhaps because many low cost airlines typically have shorter track records and are less well capitalised, the share of the world LCC fleet that is leased is higher than for the total fleet of all airlines. In particular, LCCs make significant use of sale and leasebacks. A panel discussion at the CAPA Global LCC Summit in Singapore on 25 and 26-Feb-2019 will consider low cost airline finance in some detail. LCCs need a robust business model and credible management to attract finance. Size is important, for two reasons: the need to have critical mass in fleet and network and a strong balance sheet. Cash flow, in particular the timing of cash flow, is crucial, and aircraft liquidity is also an important consideration. LCC fleets have a higher share of leased aircraft and make particularly high use of sale and leaseback. As a starting point, LCCs need to convince providers of finance that their business model is credible and durable and that management has sufficient experience and ability to execute the model, as well as flexibility to adapt it when necessary. In addition, lessors, banks and other financiers will want to be comfortable that the low cost airline can endure the inevitable competitive response to its entry and/or expansion. The extent of existing competition in the markets to be operated will influence financier thinking in this respect. The size of the LCC seeking finance is important to lessors and bankers for two broad reasons. The first is the need to have critical mass. The large majority of airlines that fail are those with fewer than 20 aircraft. Scale brings economies and efficiencies relating to operating costs, particularly if the number of different aircraft types is kept to a minimum (something that LCCs tend to do). In addition, scale leads to greater cost efficiency in marketing and branding and better route network diversification. It can also increase the likelihood of finding another airline to invest in the business if it runs into trouble. The second reason why size is important is that an airline's balance sheet is a crucial factor in its ability to finance its fleet and operations. Of course, alongside the size of the balance sheet, the capital structure is also a key consideration. A large balance sheet that is overburdened with debt would be a concern, but an airline with a large balance sheet and a high equity ratio will have more funding options than a small one with a similar equity ratio. Cash flow is another crucial factor, possibly the most important, since cash is the life blood of any airline. It is not just a matter of whether or not revenues exceed cash costs (i.e. costs excluding non-cash items such as depreciation): the timing of cash receipts relative to outgoings can make the difference to an airline's survival in extreme circumstances. There are different ways in which the timing of cash receipts can affect an airline's ability to pay for its cost base. For a small, new airline, even if it is making strong sales and achieving high load factors, it may not have immediate access to the cash generated from advance sales paid for by credit card. With new-starts, credit card companies are more likely to retain the cash until the flight is operated, in order to minimise the risk to themselves that they might lose the cash in the event that the airline fails to perform the service. For new-starts, or rapidly growing airlines, this can be a challenge, since costs often ramp up ahead of sales – for example, for aircraft acquisition or the recruitment and training of staff. This was a factor in the demise of the Nordic LCC Primera Air. Cash timing can also be a structural issue embedded into the airline's business model. An obvious example would be for airlines with strong seasonal differences in revenues. Such airlines have both higher traffic volumes and higher prices in the peak season, giving a significantly skewed revenue profile. While there will also be some downward adjustment of capacity in the offpeak season, helping to lower costs, the cost profile is typically more evenly spread through the year. Newer, smaller LCCs need a cash cushion to see them through the low season. Capacity data from OAG indicate that LCC seat capacity globally is only slightly more skewed towards the summer schedule than is all airline seat capacity. For LCCs, 60.0% of seats are in the summer season, compared with 59.7% for all airlines (source: CAPA calculation on data for the 52 weeks combining summer 2018 and winter 2018/2019 from OAG Schedules Analyser). *Summer 2018 seats as a share of the total for the 52 weeks combining summer 2018 and winter 2018/2019. Europe has the most skewed schedule, with the summer accounting for 63.5% of all seats and 64.9% of LCC seats. Many European LCCs have a business model more focused on leisure routes, and airlines such as Jet2.com, the Thomas Cook Group airlines and TUI Group airlines have close to 80% of capacity in the summer. However, this masks a range of outcomes, with larger European LCCs such as Ryanair, easyJet and Wizz not much more seasonally skewed than the average for all European capacity. Beyond the quality of the business model and capital structure of the airline, there are the aircraft themselves. Typically, aircraft have proved better investments over time than the airlines operating them. Lessors and those providing secured credit tend to prefer aircraft that are highly liquid, meaning that there are a lot of other operators of the asset. If an operator fails, investors want to know that the aircraft can easily be redeployed elsewhere. This process can be facilitated by LCCs' tendency to limit the number of different aircraft models. Another aspect to aircraft liquidity is that there should also be a large base of investors willing to trade the aircraft type. Investors also tend to prefer aircraft that can be easily remarketed and will hold their value. 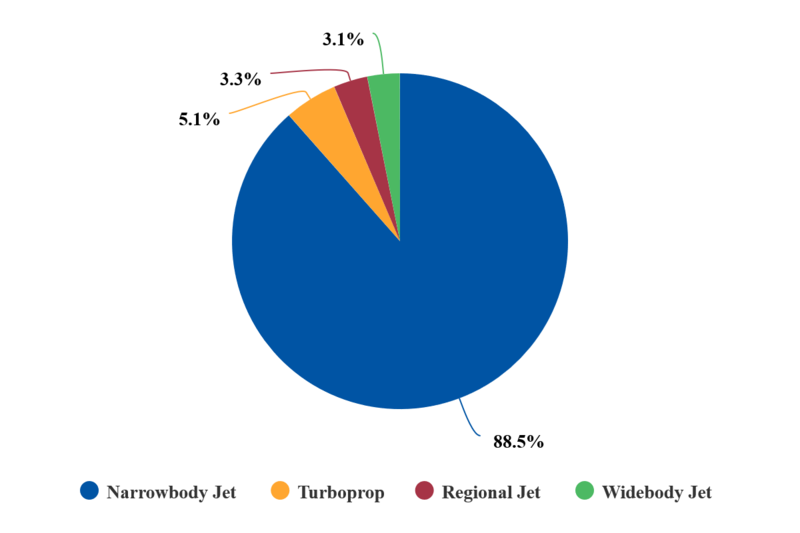 Globally, narrowbody aircraft (Boeing 737 and Airbus A320 families) are the most commonly operated types, accounting for 55.0% of all commercial aircraft in service by numbers (excluding small turboprops), according to the CAPA Fleet Database at 5-Feb-2019. These are precisely the types favoured by LCCs, most of which do not operate long haul routes and widebodies. Narrowbodies represent 88.5% of LCC aircraft in service. Widebodies represent just 3.1% of LCC aircraft in service but 10.9% of total commercial aircraft in service, so there is a large pool of widebody operators beyond LCCs. As at 4-Feb-2019, 59.5% of all LCC aircraft in service and in storage are leased, compared with 50.7% of aircraft for all operators. These percentages have been fairly stable over time, although the share of LCC aircraft that are leased has fallen from 63.5% at the end of 2013, when the share of all aircraft that were leased was 52.5%. *As at end of December. The chart below shows the top 25 LCCs by the number of leased aircraft in their fleets as at 5-Feb-2019. The list is led by Norwegian (159 leased aircraft), IndiGo (155), easyJet (146) and Azul (128). Southwest Airlines also has a large leased fleet (123 aircraft), but this only represents 16% of its total fleet of 772 aircraft. The only other airlines in this top 25 for which leased aicraft are a minority of the fleet are easyJet (46% of its aicraft are leased) and Spirit (36%). Although almost 60% of LCC aircraft in service and in storage are leased, only 5% of LCC aircraft orders are currently through lessors. Lessors always account for a much smaller share of orders than they do of the current fleet for all operators – lessors are almost 51% of the current fleet for all airlines, but only 26% of orders. This reflects the significant use of sale and leaseback, whereby an airline places the order and then sells the aircraft to a lessor for subsequent lease. According to Boeing, annual purchases of its aircraft by lessors are broadly evenly divided between direct purchases (i.e. those originally ordered by lessors) and sale and leasebacks (i.e. those originally ordered by airlines). This is consistent with data from the CAPA Fleet Database for all manufacturers: that the leased share of the total fleet is twice the lessor share of orders. For LCCs, the difference between lessors' share of current fleets and their share of orders is much higher than for all operators. This indicates significantly greater use of sale and leasebacks by LCCs, where this method accounts for the large majority of leased aircraft. For many LCCs this approach allows them to place their own orders at a time of their choosing and with agreed delivery slots, while realising cash and avoiding pre-delivery payments. The world's LCCs include some large and well established airlines with strong balance sheets who own the majority of their fleet, with leases a minority. Examples include Ryanair (only 6% of its fleet is leased), Southwest (16%), JetBlue (18%), WestJet (33%) and easyJet (46%). However, as noted above, LCCs as a whole tend to make greater use of leasing than other airlines. This is not necessarily a direct consequence of being LCCs, but reflects the fact that many (although not all) of them have shorter track records and thinner balance sheets, making ownership more of a challenge. Newer airlines and those expanding rapidly into new markets – more likely to be LCCs – often prefer the flexibility of leases, allowing themselves time to build profitability and to consider equity funding when they have a more solid track record. For information on the CAPA Global LCC Summit in Singapore on 25-26 February, please click this link.